Porcellio laevis (below) is a rather rare species which is a smooth and glossy brown-grey. It reaches 18 mm when fully grown. Its eyes consist of a number of black ocelli. It is found in gardens and compost heaps in eastern and southern England, and around Dublin in Ireland. There are no records from Wales or Scotland. 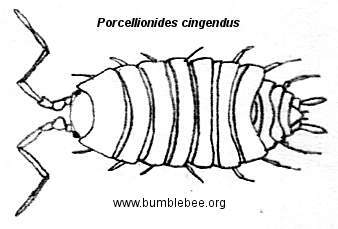 Porcellionides cingendus is creamy-yellow to reddish brown mottled with brown and dark grey in colour, and has a ridge running across each of the 7 segments after the head. It reaches 7 mm when fully grown, and runs very fast when disturbed. It is found in grassland, scrub, open woodland, in tussocks and leaf litter, mainly near the coast. Above is Porcellio scaber, it can tolerate drier places, and is slate grey, but nearer the coast orange, cream, black and red speckled morphs have been found. It is 17 mm long and 8.5 mm wide when fully grown, and is very common in the U. K. and is also found in Western Europe, Iceland, South America, and South Africa. It is covered in tubercles (bumps), and its exoskeleton is not shiny at all. This one has just moulted. Unlike insects they do not moult their whole exoskeleton at once, but in two parts. They can moult up to 25 times. It often enters houses. Androniscus dentiger above has large eyes, long antennae, and is pink, red or white with 2 long yellow lines running down its body. When fully grown it reaches 6 mm long. It is usually found in caves and mines or among garden rubble and quarries. It moves quickly when disturbed. As well as the U. K. it is found in Germany, Holland, Finland, what used to be Yugoslavia, North Africa and Canada. The 2 above the right were found when I moved a very large plant pot that had been in a shady, damp spot. 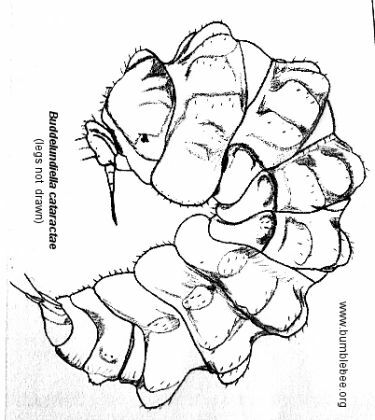 Above is the head of Buddelundiella cataractae, and below is a drawing showing it in the characteristic curled up posture. 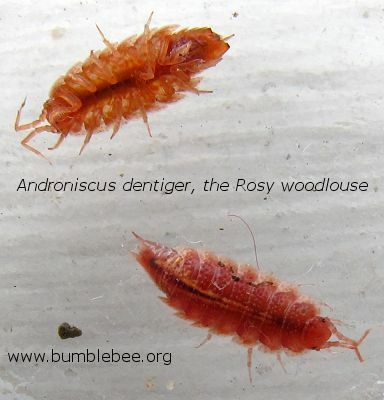 It is a small woodlouse only reaching 3 mm when fully grown. Its body is white or buff and it has a pair of 3 black ocelli. It can roll up into a ball to resemble a grain of sand making it very difficult to see, and is very rare. It is found in coastal shingle banks and under stones. As well as the U. K. it is found around the eastern Mediterranean, Finland, Hungary and Georgia. Above is Platyarthrus hoffmannseggi, the ant woodlouse. It is blind, white and found in ants nests in Wales and southern England, it is less common in northern England, and absent from Scotland, but it is fairly widespread throughout Europe. In Ireland it is recorded only in the south east. It is less than 4 mm long. Sometimes the contents of its gut can be seen through the cuticle.